As part of a larger effort to understand air quality, Gregory Jenkins, Penn State, modeled meteorological events occurring during the winter months to better understand the variables contributing to long-term dust events, which are a public health hazard. Understanding this could improve dust forecasting. Analyzing dust concentrations at 12-hour intervals, the model revealed factors driving the region's dust events. "It looks like dust is not just a constant variable over West Africa," Jenkins said. "There are periods and times when there is definitely more dust. Over the last 15 years, the model suggests dust concentrations have gone down. What's forcing the dust events? It looks like the North-Atlantic oscillation (NAO) is a big player." Jenkins said the NAO is one factor driving dust levels, but the model suggests other factors are at play. More research will shed light on these factors, he added. 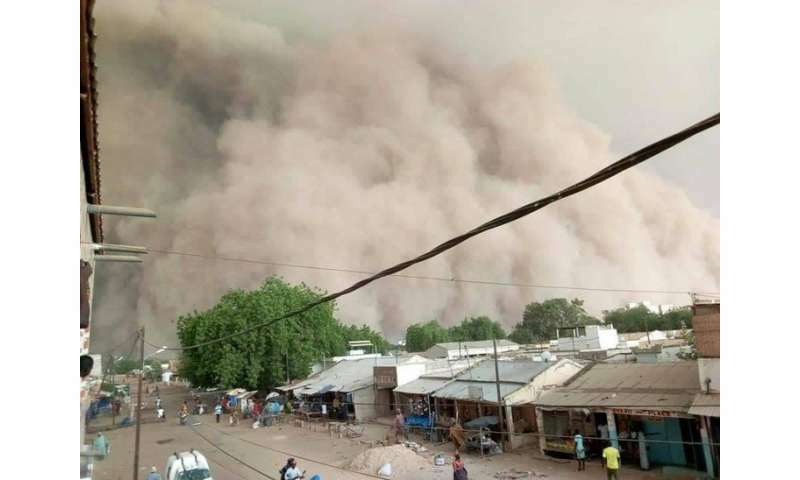 The model targeted the Bodele Depression, which is the world's largest dust source, as well as lesser, yet significant, sources in other parts of the Sahara Desert. The World Health Organization links airborne dust to increased cases of cancer, asthma and other diseases. The research, published in GeoHealth, found a lot of variation in dust events and some troubling findings. In Kano State, Nigeria, home to 9.4 million people, 42 of the 90 days of the 1990 season had unhealthy air quality by U.S. Environmental Protection Agency standards. In 1983, 35 days were unhealthy and 10 days in 2012. Similarly, in Senegal's capital of Dakar, where more than 1 million people live, 52 of the 90 days of the 1990 season had unhealthy air quality. In 1983, 41 days were unhealthy and 39 days in 2012. "There's something driving this kind of variation and ultimately, exposure," Jenkins said. "Public health officials need to know this data. In some years, half of the season had unhealthy air. If you have asthma, it's more days than that, with air quality standards for people with respiratory issues occurring at lower dust concentrations." Jenkins said in a region with the greatest threat from dust, the fewest safeguards are in place. Ground measurements, which are commonplace throughout the world, are nonexistent across Africa. Public health data also is sparse, making it difficult to understand the true impact of dust. Research published in Nature points to a "robust relationship between air quality and infant mortality in Africa." The region's population is expected to double to 700 million by the year 2050. To address the lack of reliable data in West Africa, Jenkins has deployed research-based air-quality monitors throughout West Africa—Senegal, Cape Verde, Burkina Faso and Ivory Coast—and is working with health officials to gather more health data. Partnering with microbiologists at Cheikh Anta Diop University in Senegal, researchers collected dust samples to find which pathogens were present on the dust particles. Jenkins is working on companion research for the summer months, where dust reaches higher altitudes and travels into part of the U.S., the Caribbean and other areas. His research aims to address what air quality means for the region: How dust affects the public; the strains on health care systems; and how citizens and their governments can be educated and prepared to deal with the issue. He said the solution is interdisciplinary, which is why his meteorology background is helpful when venturing into the public health research. "My ancestors came from West Africa. I've worked there on the ground. I see the level of poverty and for me it's not just crunching numbers or running models, it's actually serving a higher goal of helping those who have less," Jenkins said. "I don't feel there's any reason why a child should die from respiratory disease if there are ways to avoid that. We don't want that for our children. If there are ways that we can help, we do it."